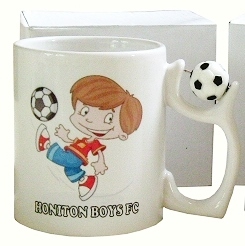 Personalised White Photo Mug with Novelty Football Handle. This is a great personalised gift for Birthdays, Anniversaries, Fathers Day, Wedding Page Boy Gifts and Christmas. Also a perfect gift for Football Club moments for each team member to have their group photo on!